[F]rom the peaks of the Blue Ridge and the Great Smoky Mountains, to the river valleys of the French Broad and Catawba, North Carolina has a long history that is steeped in rich Appalachian traditions. Despite the Hollywood “hillbilly” stereotype, Appalachians carry a sense of pride for their culture, language, and heritage. 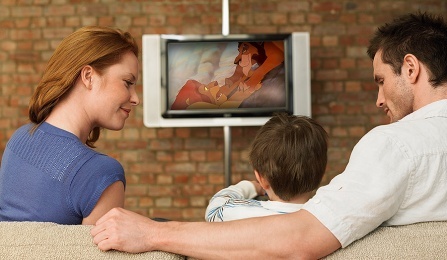 [B]ambi’s mother, Mufasa from “The Lion King” and Elsa’s and Anna’s parents in “Frozen” represent some of the characters who die in Disney and Pixar animated films, and these potentially shocking moments for young audiences provide critical opportunities for adults to discuss end-of-life issues with children, according to a new study by a University at Buffalo researcher who specializes in end-of-life communication. Before you ask, no, you can’t drink your dead relatives. [O]n Sunday, California Governor Jerry Brown passed AB 967, an innocuously named bill for a not-so-innocuous law. The bill, proposed by assembly member Todd Gloria, a San Diego democrat, will make it legal for Californians to liquefy their corpses after death in a bath of caustic juice. I don’t often think about death. Well, to be precise, I don’t think about my own death. So rarely, in fact, do such personally existential topics occur to me that my far more reflective husband has suggested we may be of different species. But I do think about other people’s deaths almost daily — not in, like, a serial killer way, but in that my occupation as a writer covering politics and current events means death constantly invades my work. There’s death in the headlines as soon as I wake up and death in the policy topics, like foreign affairs and criminal justice reform, on which I often offer commentary. Last year I completed a seminary degree, and I wrote my master’s thesis on the theology surrounding the death of Christ. What happened in Las Vegas was indeed hellish, but the window is not newly open. This is the way our world has worked throughout the great bulk of history, and it is the way it continues to work around much of the globe today. Think of the persistent evils of conquest and slavery and genocide, plague and flood and fire. Think of the Lisbon earthquake, which in 1755 killed as many as 100,000 people and caused so much anguish it changed the course of European philosophy. Think of the famine and cholera in Yemen right now, where conditions are so dire children are dying of dehydration in the womb. Think of the slaughter in Myanmar, the decimation of Puerto Rico, the refugee crisis in the Middle East. Yes, we have a window open to hell, but we did not open it last weekend in Las Vegas. It has been open a very long time. But our insulation comes with side effects. It makes us unduly surprised and incapable of appropriate response when grave evils do befall us. We are fixated on asking how such an evil could happen to the detriment of more valuable questions. 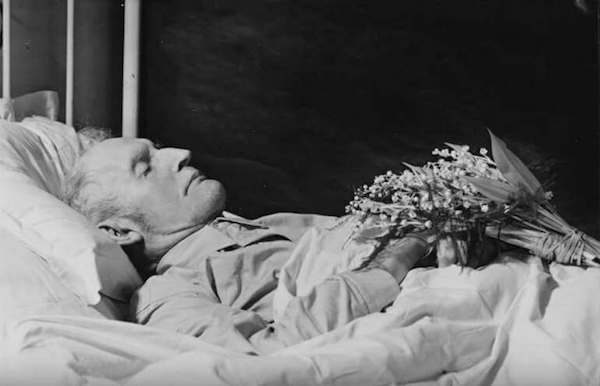 As a potential remedy, I propose reviving memento mori, the practice of remembering death. 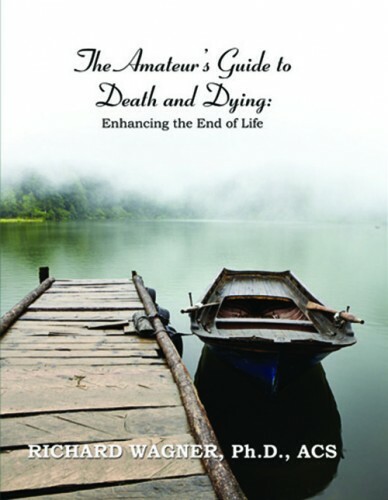 Though there are injunctions to meditate on mortality to be found in pre-Christian and non-Western philosophy, memento mori — Latin for “remember that you will die” — is classically a Christian phenomenon that flourished in the Western world from the Middle Ages through Victorian times. 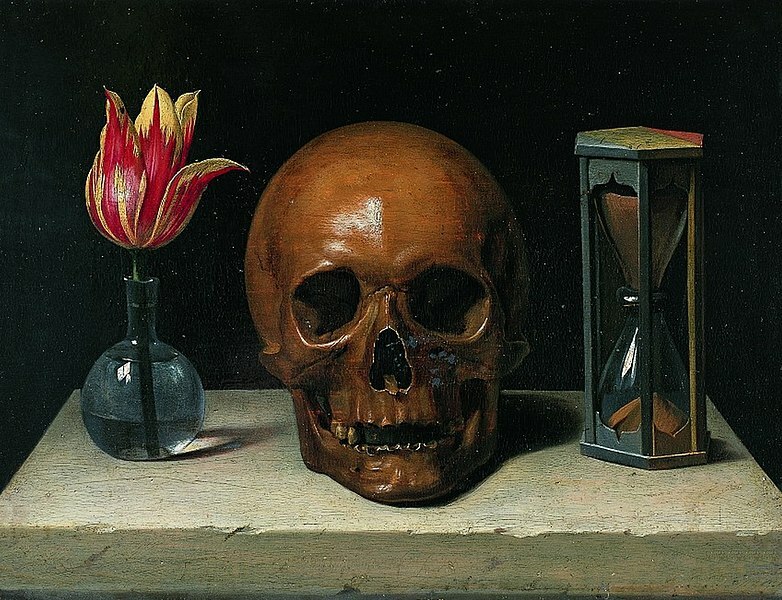 Memento mori was never a single act or image, but its most identifiable form is the representation of death and the fleeting passage of time in medieval and Renaissance art. Skulls were a favorite theme, as were running hourglasses, wilting flowers, and burning candles. Sometimes full skeletons appeared, inviting people from all walks of life to join the inevitable danse macabre. In poem and fresco alike, the story of “The Three Living and the Three Dead” saw three kings meeting three walking corpses of monarchs past. 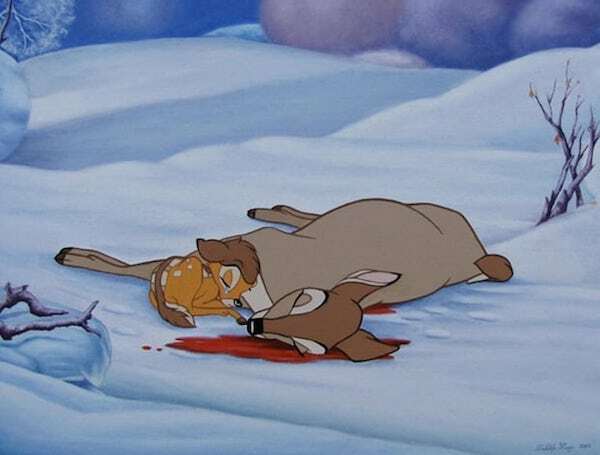 “Quod fuimus, estis; quod sumus, vos eritis” — what we were, you are; what we are, you will be — the corpses say, cautioning the kings against a frivolous and immoral life. Still, I am going to die. You are going to die. We are all going to die. That is something we should remember. Memento mori should not make us cynical about death and other evils, but rather mindful that they are happening to others and better prepared for when they happen to us. This mental habit becomes all the more necessary when you live, like Jimmy Kimmel and me, in circumstances where “laugh[ing] about things every night” is plausible. It is a habit that keeps us from being taken by surprise that our world has a window open to hell, and that keeps us doing what we can to shut it. 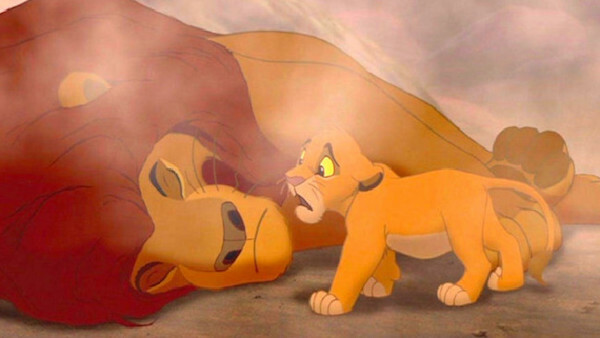 [S]aying goodbye to a pet is an inevitable experience many families will experience. And telling the truth to children and allowing them to grieve is crucial in helping them deal with their loss, as well as recover from it. 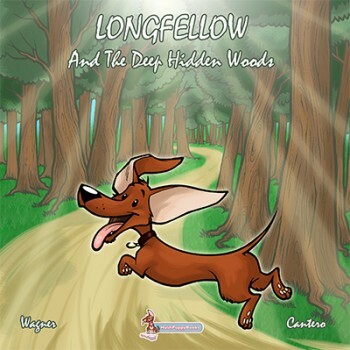 According to Ms. Newstadt, books can be helpful to introduce the topic to a child with the family without any other distractions. She said parents could explain to their children that the animal has been to the doctor for medicine and that they’re waiting to see if it helps the situation. A toddler is unlikely to understand death but those words should be used, she added. According to the local therapist, it is important to allow your child to express their feelings and deal with grief. 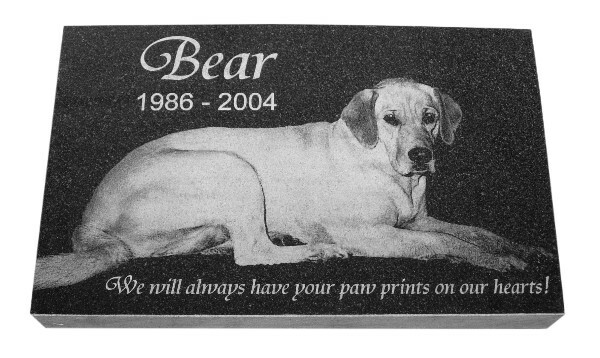 A pet memorial would be a crucial part of the process for a child and the entire family, she said. According to Durham Region registered vet technician Sarah Macdonald, it is required of veterinarian clinics to dispose of a pet’s body once it passes away. A large majority of clinics also offer cremation, she said. According to Ms. Macdonald and Ontario.ca, homeowners are permitted to bury their pets on their own property. For those living in an apartment, Ms. Macdonald recommends cremation. 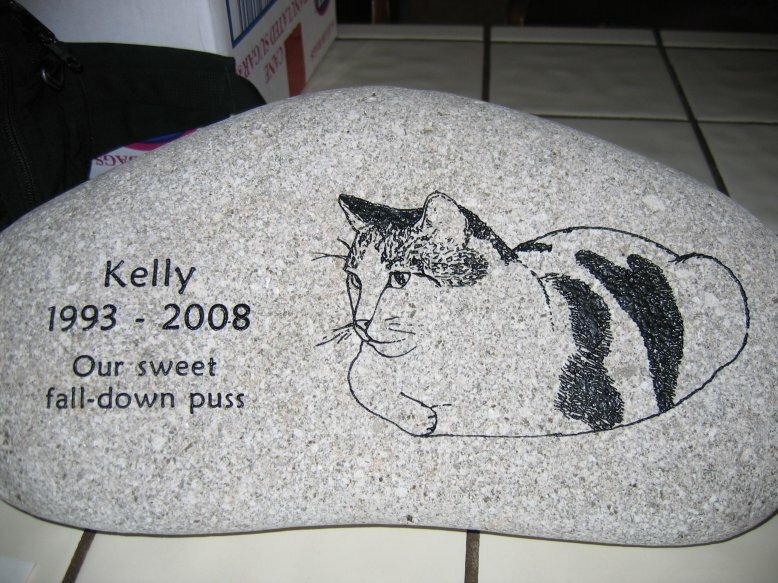 The ashes can be kept in a special urn inside the pet owner’s home or be scattered in a special location for a ceremony or as part of a memorial, she said. 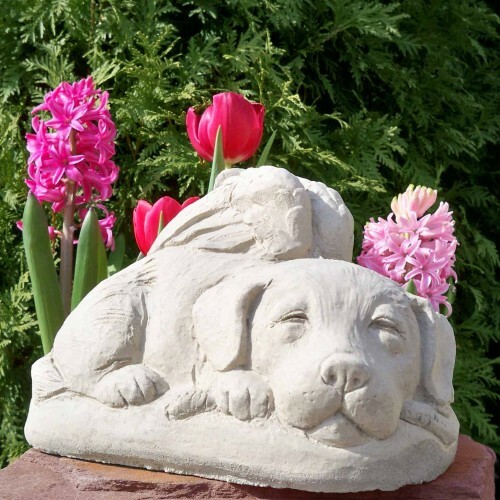 For those looking for more ways to memorialize their pets with keepsakes, funerals, cremation ceremonies, and more, Ms. Macdonald recommends Gateway Pet Memorial, specializing in pet aftercare throughout North America. Parents should be focusing on positive coping strategies by modelling self-expression, letting the child know that it is OK and normal to have these feelings of sadness and that it is important to express, said Ms. Newstadt. According to Ms. Newstadt, parents shouldn’t approach the conversation until the child is expressing sadness. Headstones at Catholic Cemetery No. 1 in Victoria. [I]nside Memory Gardens, a well-groomed cemetery off Cuero Highway, marked graves and floral arrangements pay tribute to the lives of thousands of Victorians who have died. Near the rear of the grounds, 50 plots have been reserved for members of the Victoria Islamic Center. Even though many Islamic communities throughout the United States bury members in Islamic-only cemeteries, Victoria Islamic Center Imam Osama Hassan said the 50 plots in Memory Gardens fit the needs of the community. “It has worked out perfect for us. It’s the right size for our needs for the future,” he said, mentioning the small size of its congregation. Like many other religious sects in South Texas, including Christianity and Judaism, Islam has its own unique rituals for burying the dead. Often, Islamic communities purchase their own cemeteries, especially if they are part of large communities of Muslims or live in larger cities. But death is an important part of life and how a Muslim is honored in death is especially important for believers. Islamic members are not the only community in Victoria with special requirements for death. In downtown Victoria, off Vine Street, a Jewish cemetery dating back to the mid-1800s indicates some of the city’s earliest residents were Jewish, including the first Jew to settle in Victoria, Abraham Levi, who established one of the city’s earliest grocery stores on Main Street. 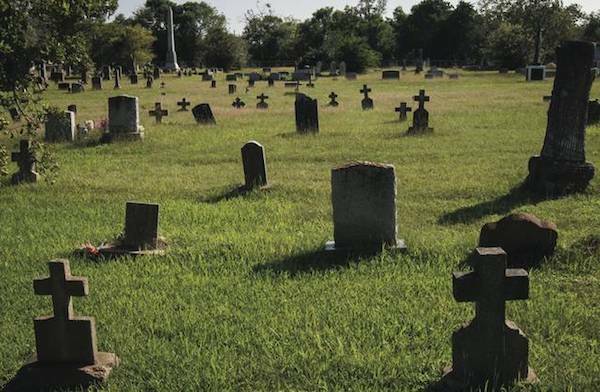 Catholic and early Protestant cemeteries also remain pervasive throughout the region, established in the early 1800s as settlers moved in and established churches and parishes. The Rev. Max Landman, of Sacred Heart Catholic Church in Hallettsville, said Catholic funerals are distinct, in part because of their reverence for the dead. As Halloween approaches, a time of year that gives a not-so-subtle nod to death, cemeteries and afterlife, the season offers a unique opportunity to examine the customs of area religions as they honor the members of their congregations in the religious context they acknowledge. Here are a few of the many death traditions of Catholics, Muslim and Jewish believers around the world. In most religions, tombstones and grave markers are permitted and visited by the living. When a Muslim dies, the body should be buried as soon as possible. Three to four hours is preferable, up to one day, but no longer than 48 hours. The bodies are not embalmed, and careful consideration is given to treatment of the body because Muslims believe the person can still hear and feel pain. Autopsies and cremations are not acceptable for this reason; however, organ donation may be permitted in some circumstances because it is seen as a charitable event. Instead, Muslims are washed with soap and water and wrapped in a white cloth. Men prepare male deceased, while women prepare female deceased. It is preferable that Muslims not be placed in a casket at all, allowing the dead to return immediately to the dirt. Overseas, Muslims are buried directly in the ground. In the U.S., caskets are required, so Muslims typically place the coffin upside down to encapsulate the body once it is placed in the ground. Bodies must lie on their side and point toward Mecca in Saudi Arabia. 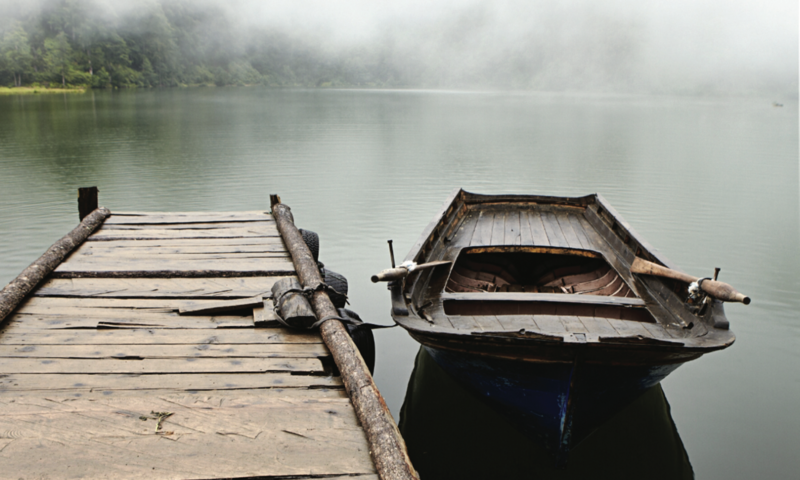 The typical mourning period is three days, and believers are encouraged to return to normal life. This varies depending on each person, with some wearing black for many years in remembrance of a loved one. Priests are called both right before and after death to pray the appropriate rites over the body. Vigils are usually held on the evening before Mass, and there is often a praying of the rosary. 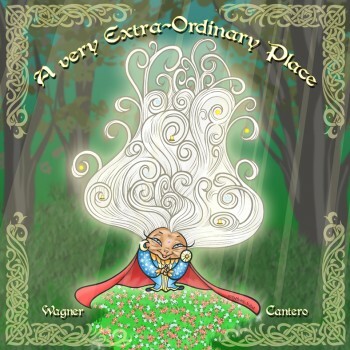 This is typically the place where eulogies and tributes are delivered. 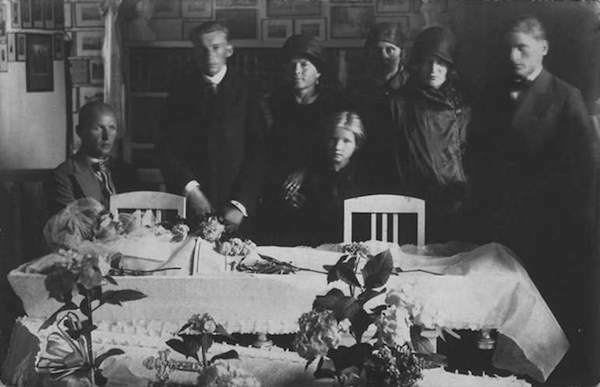 Caskets can be covered with white linens, or palls, and blessed with holy water as a reminder of baptism. Bodies are allowed to be embalmed, however organ donation and cremation remain areas of disagreement among Catholics. It is preferred if cremation is being performed that the body not be cremated until after the funeral Mass, so the deceased can be present in the church for the service. At burial, the Rite of Committal is given at the blessed burial site. The Lord’s Prayer is typically said upon closing. When a Jew dies, the “Dayan HaEmet” prayer is recited, which acknowledges God as the true judge. Jewish tradition prefers the body be laid to rest as soon as possible, as soon as one day, so funeral planning often begins immediately. It is also preferable the body not be unattended and is often given a “shomer” or guardian. If funerals cannot be held right away, exceptions can be made. Sometimes, the body is refrigerated while waiting on the funeral. The body is fully dried and dressed in a simple white cloth called a “tachrichim.” Men are typically buried in a “kippah” or skull cap, and also a “tallit” or prayer shawl. Jews tend to avoid holding funerals on holy days or Saturdays. Organ donation is generally accepted and seen as a good deed. 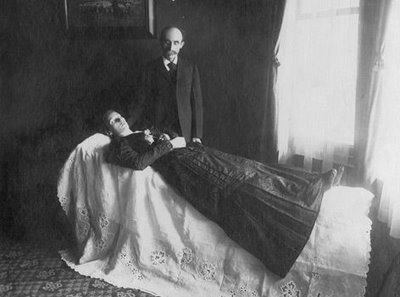 Autopsies and embalming are generally not accepted unless required by law. 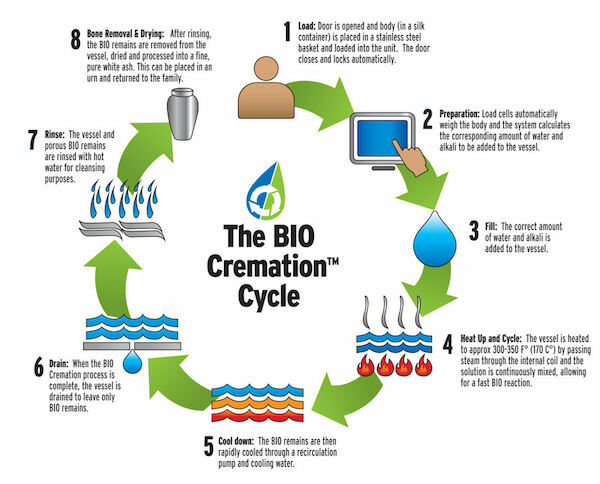 Cremation may be accepted depending on the degree of orthodoxy of the Jewish family. Orthodox Jews do not permit cremation, while conservative and reformed Jews may allow it. It is customary for the tombstone or grave marker to be put up one year after the death. A stone is usually placed on the grave within the first 30 days to indicate someone has visited. 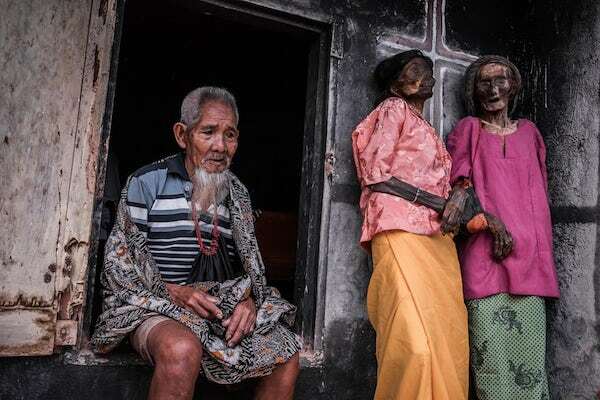 [I]n contrast to Western norms, Torajans people, who live in the mountains of Sulawesi in Indonesia, treat their beloved relatives as if they are sick not dead. In this picture, a grandchild stands next to her deceased grandparents. 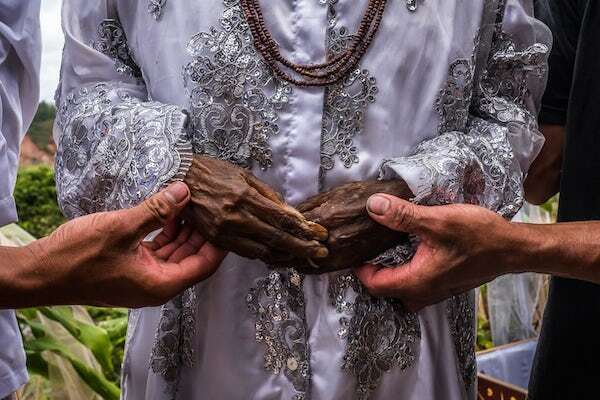 Yohanis (right), was 77 years old and passed away two weeks ago; his wife Alfrida Tottong Tikupadang (left), was 65 years old and passed away five years ago. 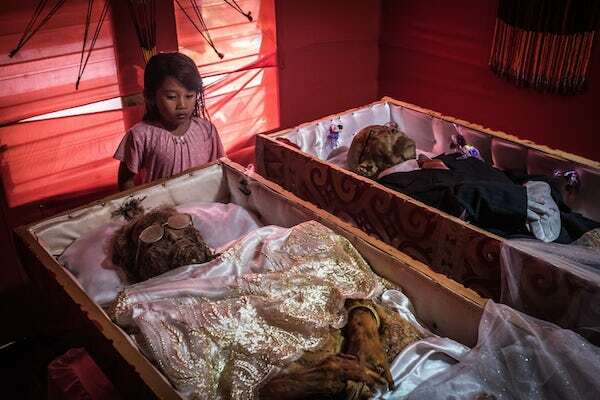 In Toraja, it is customary to feed the deceased every day and to keep the corpses cozily bedded in a separate room of the family house until the family can afford a proper funeral. 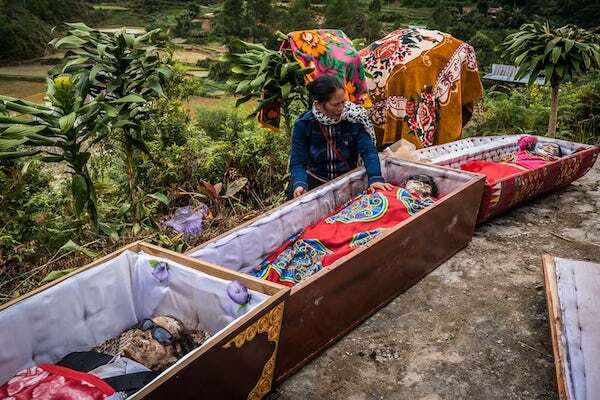 After the funeral rites of “Rambu Solo”, the deceased are finally buried in tombs. But still they are regularly visited, cleaned and given new clothes in a ritual known as Ma’nene (‘Care of Ancestors’). Datu died 35 years ago. In this picture relatives are removing the insects that covered her. It’s customary for the Torajans to put gifts in the coffin, such as a bracelet or a watch. Others might even bury a diamond with their loved ones. Grave robbery often occurs and some Torajans keep their gifts a secret. Grandpa Ne Pua passed away when he was 85 years old. 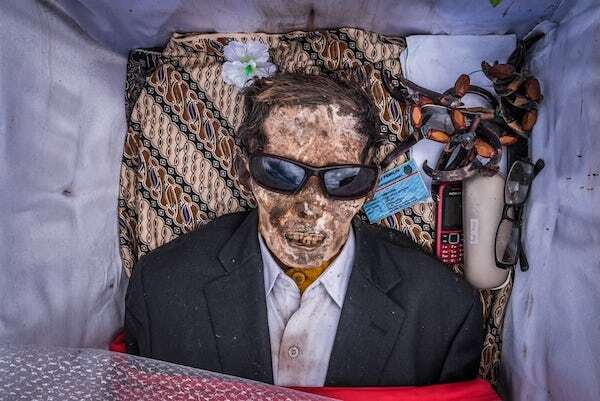 He has been buried in his favourite suit together with his favourite belongings. Roughly 50 bodies are being moved from Balle graveyard to a new mausoleum. 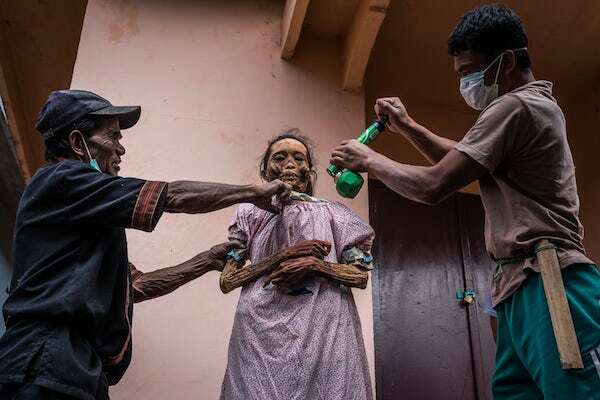 As soon as the traditional coffins are dragged out of the tomb, the relatives put on surgical masks and attend to their loved ones. 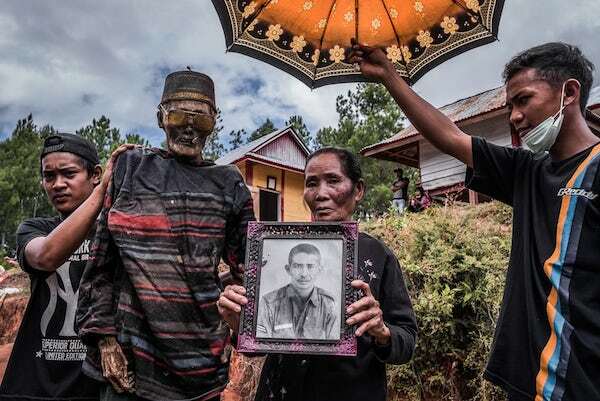 In this picture, a family presents Djim Sambara, who died two years ago when aged 90. Sambara was honourably buried in his military uniform before the family changed his outfit. 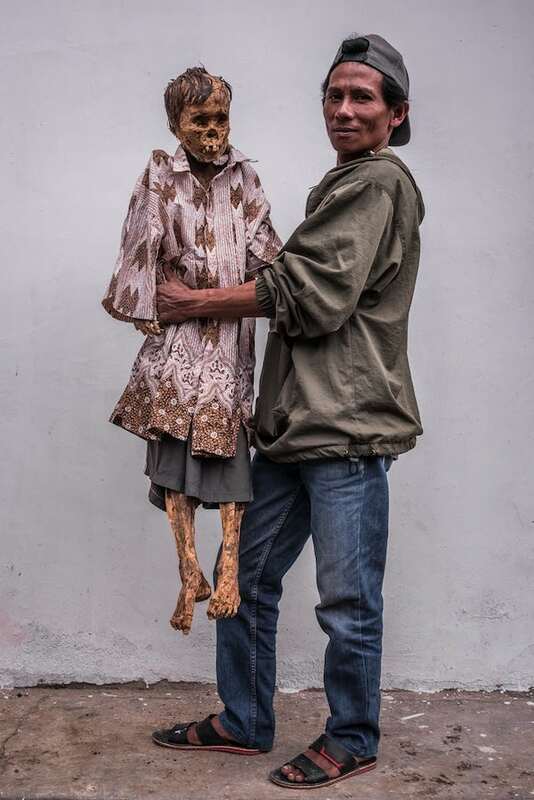 Andaris Palulun is given new clothes by his brother Ferri before returning to the family tomb. He died 20 years ago. Todeng died in 2009. 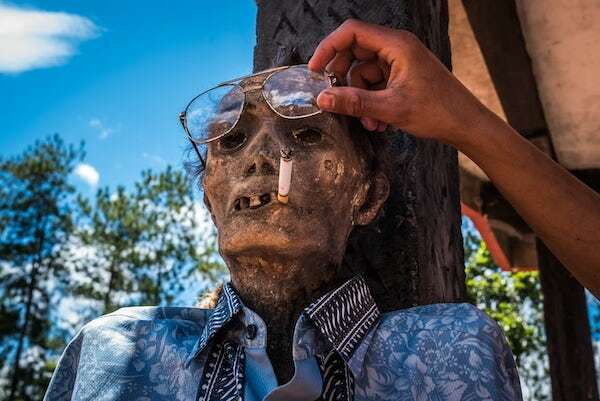 A young relative of his, Sam, lights him a cigarette and changes his glasses. 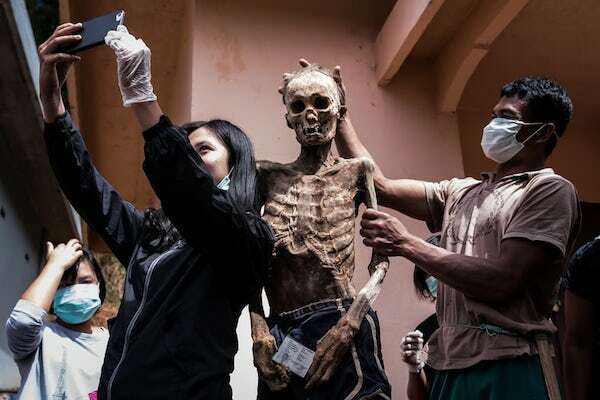 Yuanita takes a selfie with her relative Allo Pongsitammu who passed away roughly 20 years ago. This picture shows Ne Duma Tata waiting to return his deceased wife to the mausoleum. Ludia Rante Bua (right) died in 2010. She stands alongside her sister. With the bodies having been dutifully cleaned, they are carefully returned to the mausoleum.